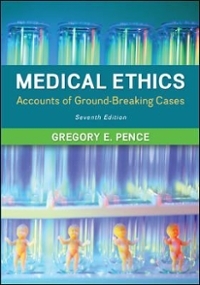 Medical Ethics: Accounts of Ground-Breaking Cases 7 Edition A Doody's Core Title for 2015.Gregory Pence helped found the Bioethics field and has published in this area for forty years. In this text his single, authorial voice integrates descriptions of some of the most famous bioethics cases and their issues. The text is the only one that follows cases over decades to tell readers what did, and often, what did not, happen. This new edition retains in-depth discussion of famous cases, while providing updated, detailed analysis of newly raised issues.